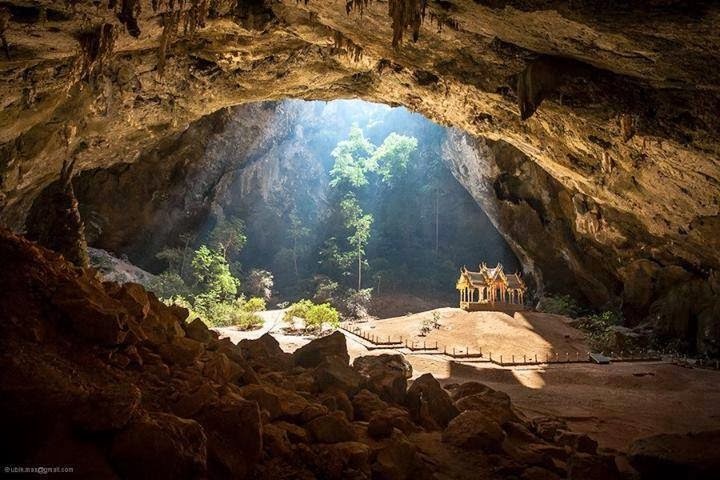 Home » cave » temple » thailand » This is a temple inside a cave in Thailand! This is a temple inside a cave in Thailand! One of the town’s most attractive side adventures is Khao Luang Cave, regarded as the largest and most important in the province. It was often frequented by the royal family as a meditation and picnic spot since the reign of King Rama IV (mid-19th century). The cave chamber lies about 90ft below ground and has numerous openings in the ceiling that allow for natural lighting. The limestone cave is decorated with beautiful stalactites and stalagmites, and more than 180 Buddha statues are scattered around the cave’s 3 main chambers. Of these, the most impressive are the 12ft high Buddha image and the 16ft Reclining Buddha, both cast under the royal command of King Rama V.
40 kilometers to the north-east of Chiang Mai is Meung On Cave and 2 hot springs. Use the rough map below to help you find them. You can also use my Chiang Mai map to help...head east on Road 1006, past the train station. The cave is well worth the trip. It's not a huge cave, but it is big and deep. Be careful heading down the many steps (at one point you have to duck under rock so I wouldn't recommend the cave to everyone). The cave is lit up well throughout so you won't need a torch. It opens into a large chamber where you'll see a long reclining Buddha and another sitting Buddha.